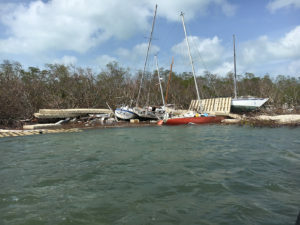 Vessels and debris along mangrove fringe in Boot Key Harbor, Marathon. 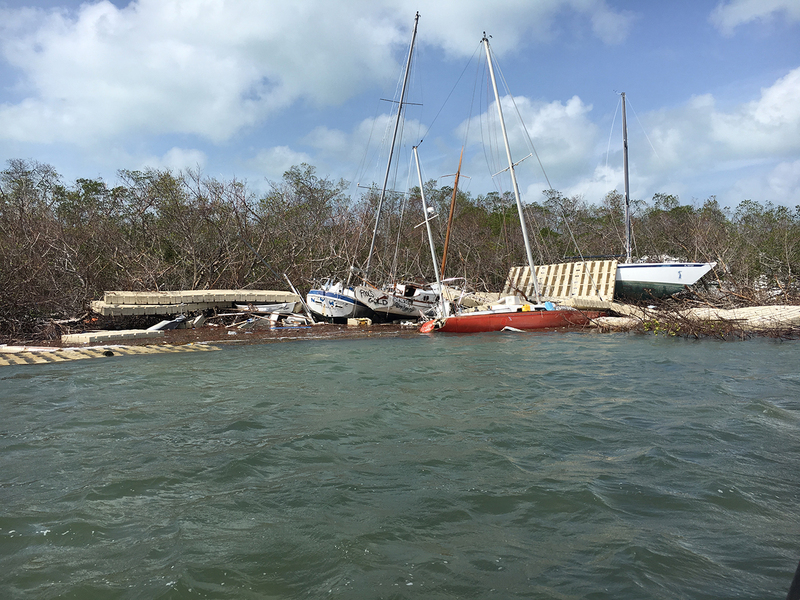 Hurricane Irma roared through the lower Florida Keys as a Category 4 storm on September 10, 2017 and made landfall again in southwest Florida near Marco Island as a Category 3 storm. Under the National Response Framework (NRF), FEMA designated the Fish and Wildlife Conservation Commission (FWC) as the lead agency in charge of managing the thousands of vessels that sank or were washed up on sensitive shorelines throughout the state. FWC teamed up with the USCG, USEPA. NOAA and FDEP establishing an incident command post in Miami on Sept. 18, with the mission of mitigating pollution threats across Florida from vessels displaced by Hurricane Irma. Just four days after landfall, NOAA conducted flyovers of the most heavily impacted areas. This imagery was used to identify debris and target vessels; vessels that were actively discharging pollutants were prioritized for immediate response. Assessment teams using a survey application were sent to the vessels to validate the findings, collect additional data and post information for the owner where possible (many vessels were completely submerged). The assessment teams ultimately inspected 2,679 vessels and identified 2,454 for pollutant recovery and removal. Over the course of several months, private parties removed 1,445 of their own vessels, leaving 1,009 for the Irma ESF-10 Florida mission. Florida Fish and Wildlife Research Institute (FWRI) staff led the Environmental Unit (EU) that was established to manage the many issues associated with recovering pollutants and removing vessels from shallow water habitats, mangrove fringes, salt marshes, critical habitats, archaeological sites and other resources-at-risk without causing additional damage. Based on permits and regulations required by NOAA, USFWS, FKNMS, DEP, SHPO and THPO, the Environmental Unit established a comprehensive set of Best Management Practices and provided training for the vessel removal teams. The EU produced a “grid package” for each vessel removal that graphically identified the shoreline habitats, biological resources and summarized the BMP’s to protect those specific resources at risk during removal operations. The grid packages relied heavily on Environmental Sensitivity Index (ESI) data that is developed and compiled largely from the work of FWC scientists. ESI data focuses on habitats, species and socioeconomic resources that are particularly sensitive to oil spills. This includes critical habitats, threatened and endangered species, juvenile populations, and managed areas such as wildlife refuges, parks and archaeological sites. Geospatial representation of the ESI data helped identify vessels located in sensitive areas and remove them with minimal impacts. Since ESI data combines information from habitat, species and socioeconomic information, researchers have found it is useful for a wide range of applications beyond oil spill response. The EU also established a Natural Resource Advisor program for on-scene assistance with vessels that were found deep into mangrove stands or shallow water habitats such as seagrasses, corals and hardbottom. Removal of vessel deep in mangroves on Sugarloaf Key. The Vessel Removal Teams were made up of USCG personnel, FWC officers in patrol boats and contractors. The first step was to recover any hazardous materials, such as fuel, lead acid batteries, propane cylinders, flares, etc. Then, a variety of equipment and methodologies such as lift bags, roller tubes, winches, cranes and barges were used to remove the vessels while minimizing additional impacts. 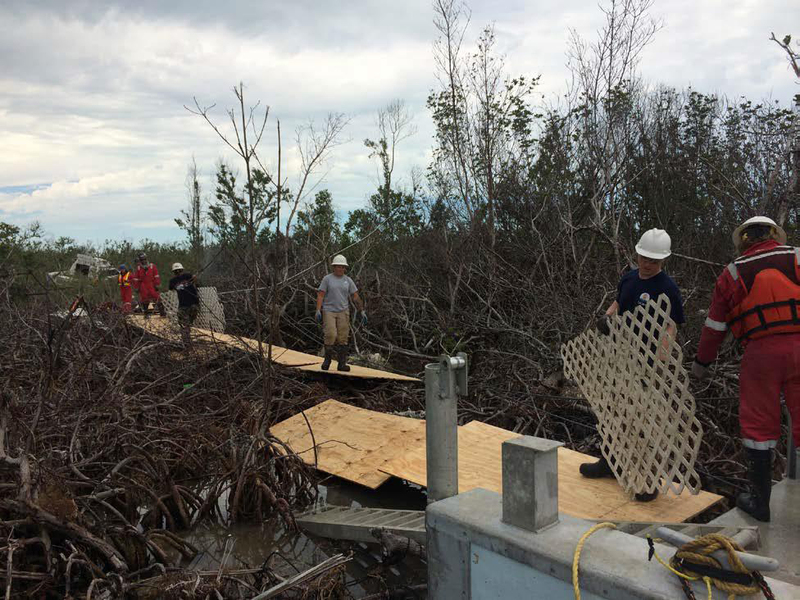 When possible, the vessels were removed through the already damaged pathway in which they entered, for example, inside a mangrove stand. The vessels were then transferred to storage areas where the owners were given at least 30 days to reclaim the vessels or remove any personal belongings. Unclaimed vessels were then recycled to the furthest extent possible, with the remainder sent for disposal. These vessel removal teams removed a total of 943 vessels, while 66 vessels were left in place due to operational or environmental concerns, after the pollutants were recovered. The incident command post in Miami stood down on Jan. 18, 2018 after successfully completing its mission. The Irma ESF-10 mission demonstrates the crucial collaboration between state and federal agencies during a large-scale environmental disaster. 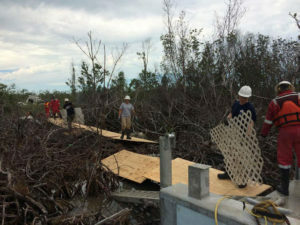 By creating an interagency response, capabilities are greatly expanded for rapid cleanup of the sensitive and unique areas of Florida’s coastline. The Fish and Wildlife Research Institute is sharing the lessons learned from the Hurricane Irma response with responders, planners, researchers and academia through workshops, exercises, conferences and other networking opportunities. In the chaos following Hurricane Irma, most Floridians don’t give thought to the thousands of pleasure craft and other vessels displaced by a powerful hurricane. Articles like these serve the purpose of educating the public about successful cleanup efforts such as ESF-10, which otherwise may go unnoticed by most Floridians. Our estuaries, coastlines, reefs and other sensitive and unique Florida habitat are kept more pristine by timely and organized responses like this. Hurricanes are a part of life in Florida, and Floridians can rest easy knowing that teams like those assembled for ESF-10 are ready to go, with a plan in place, when the inevitable occurs.